As you can see, I am pretty much done with Jessica's hair. I will tweak her hair and still add stray hairs here and there, but for the most part, it is done. Now onto the rest of her lovely face! Hopefully I'll be done within the next week! 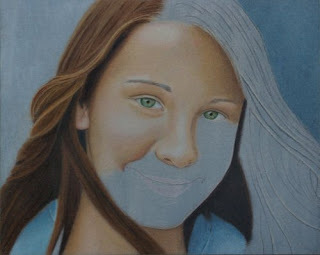 Here are updates for two paintings I am currently working on. First is the update on the soldier. I have pretty much finished the flag, except for the stars, which I haven't even started yet. I need to tweak the flag's colors a bit, but I guess it's okay for the most part. 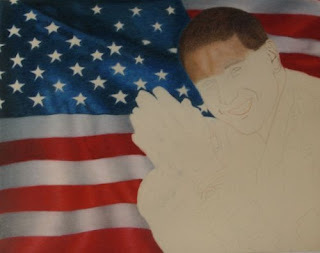 As you can see, I have started on the soldier, but will also work on the stars little by little at the same time as I work on the soldier. Second is a new portrait I'm working on. This is Jessica, a young lady of 13 years who goes to my church. 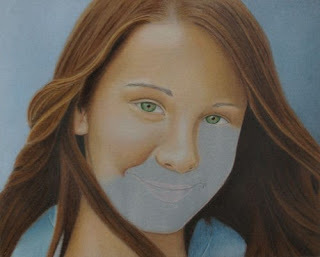 She's obviously a beautiful young lady and I've been wanting to paint her for a few years now. I was fortunate to have a few moments of photo shooting with her a couple of weeks ago, and came away with fantastic shots!! I just had to paint her right away! I need to see if I can set up some more photo shoots with her. She's a natural model. This is on white Pastelbord with Prismas. 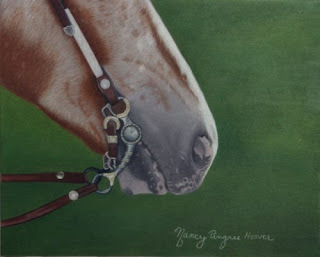 I really have developed a preference for working on gray Pastelbord, especially for portraits, however, I do not have any gray bord at the moment. So, I used Neocolor II steel gray to create the gray underpainting instead. I would lay down a layer of Neocolor, brush it, let it dry, and do it again. I put down probably five layers total, one at a time. It worked out beautifully! I was worried about the tooth with using that much Neocolor, but there's plenty of tooth left. Lesson learned: I can buy white Pastelbord and use Neocolors for the underpainting instead of stocking up on all the different colors and sizes of Pastelbord! Of course, this also used up most of my Neocolor as well, but that's still cheaper in the long run - I think. I have been using Ann Kullberg's tips on doing hair from her Portrait CD, because we all know I stink at doing hair. I think it's coming out okay, although I will still be tweaking it and adding some stray hairs, etc. I'll start on the other side of her hair next. Okay, I'm calling this one done! I will wait until tomorrow to spray and varnish it, just to make sure I don't see anything that needs fixing. 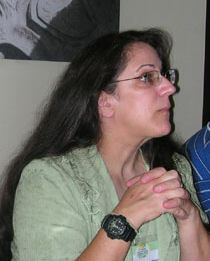 I'm posting a close-up to, just for fun and for anyone who might be interested. This was a fun piece though and I enjoyed doping it very much. Now, onto the next one! I have finally completed my most recent portrait commission, and am currently working on two other paintings. The first is SFC Adams. This soldier portrait is of a man who was killed in action in Iraq, leaving behind his three children, his wife, and his mother. The original photo had the soldier leaning forward, elbows on knees and hands together, almost in an attitude of prayer. I received the photo with the soldier's hands partially cut off. I asked my client if I could turn the portrait into a landscape view so I could see all of his hands. In addition, my client wanted to have a flag behind him. So, this is what I came up with. So far I have only been working on the background, which is not nearly finished. I haven't even begun the stars yet. This will take awhile, and because it is on paper and we are entering into the hot and humid season, it may not be done for several months. Because of this, updates may not be very often. This portrait is being done on sand colored Colourfix paper, 11" x 14" in size, and using only Prismas (with bristle & stencil brushes for blending). This photo is appearantly not quite as good as I thought it was. I'll get a better photo for my next update. 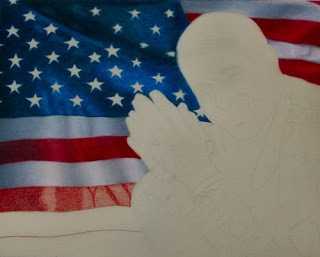 For more information on Soldier Portraits, a non-profit organization made up of artists who paint portraits of fallen soldiers for free, please see Fallen Heroes. The second one is a fun piece!! 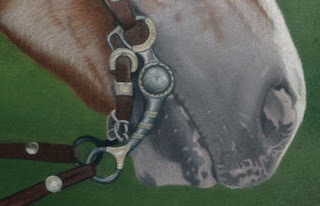 I have been wanting to paint a picture of a very detailed and decorative horse bit and bridle, but have had a great deal of trouble finding just the right ref photo. Whenever there is a rated horse show around here, I either can not get close enough to the horse, the lighting is too poor, or the horse will not stand still long enough for me to get a good photo. So I went to WetCanvas' Image Library and found a very nice photo that I could use. 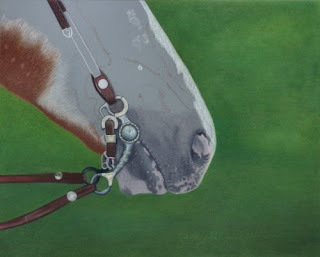 This is on gray Pastelbord, and is 8" x 10" in size. I used a watercolor pencil wash for the background, with Prismas over the top. The rest of the painting I am using only Prismas with bristle and stencil brushes to blend. The background is just about done (although in this photo it looks a bit blotchy. In real life it is nice and smoothly blended together), but nothing else is even near completion. I have been working on this quite a bit today and should have an update tomorrow.